COIN - "used as an abbreviation for COunter-INsurgency assets"
Counter insurgency is a force or action taken by an established government against those who oppose it (insurgents). Following WW2, the United States began developing strategies and tactics for use against insurgencies popping up around the world. An aspect of this doctrine of developing "assistance" for the many lesser developed countries was how to arm them, for their fight against Communism and its various manifestations. The Piper Enforcer was one experiment in this effort. A wildly popular and successful aircraft, the North American P-51 Mustang, was upgraded into a weapons platform that could deliver large amounts of ordnance. Capable of being flown from unimproved airfields, by indigenous pilots, it appeared to be a good fit for the COIN role. 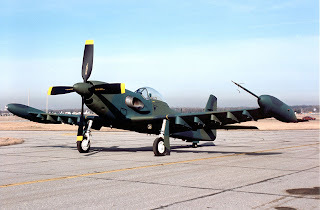 Originally developed by Cavalier, a company well known for its 2 seat executive conversions of P-51's, the concept was sold to Piper Aircraft, a company with much larger production capacity and the potential strength needed to sell the concept to the USAF. Beginning in 1971 Piper tried to develop and sell the concept of the Enforcer, finally retiring the project and the 4 aircraft built in 1984.